This was a fun and fast quilt top to make. I started it last Saturday and finished it on Friday. It measures 50″ x 60″ which makes for a baby quilt or a small lap quilt. It is hard to get a good picture of this quilt top. The white with black reads as light gray and the black with white reads as darker gray. Enlarging the picture will show all the different fabrics in this top. 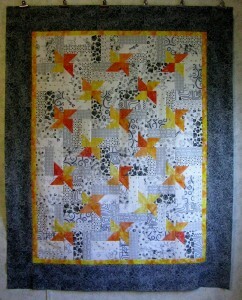 This is the next machine quilting project. I already know what quilting designs, thread colors and backing that I will use. 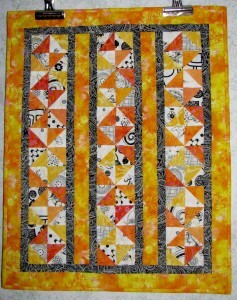 The yellow & orange accents were made using the stitch and flip method on 2 1/2″ strips. I usually toss those little triangles, but I saved them from this project. 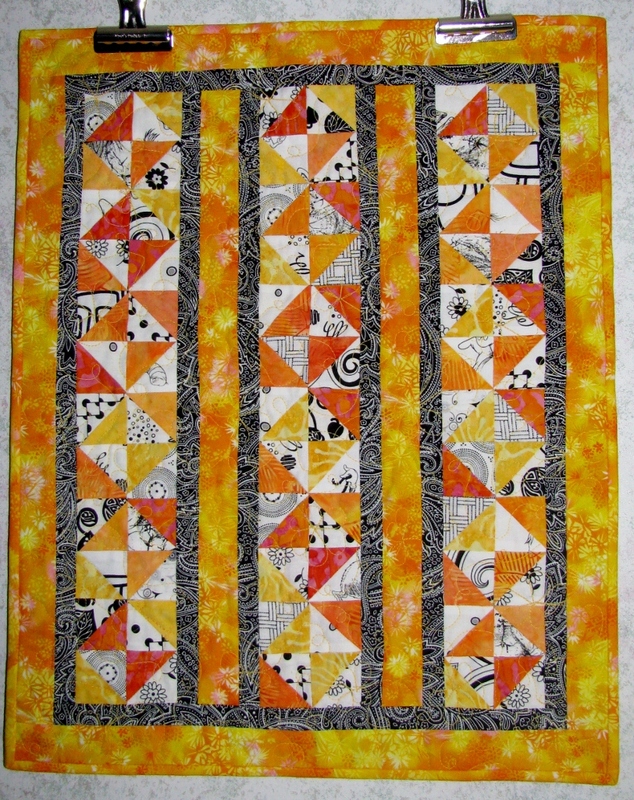 They made 1 3/4″ half square triangles that end up as 1 1/4″ in the finished quilt. They were just so darn cute, that I put them in a doll quilt. Don’t let this photograph fool you – this doll quilt is 15 1/2″ by 19 1/2″. 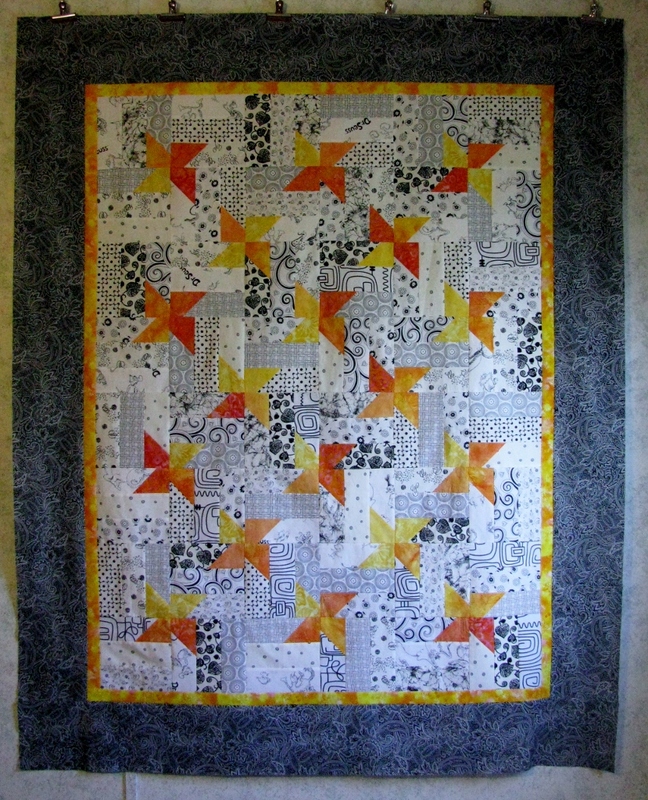 I designed this quilt as I was sewing along. I didn’t have any idea of the final look of this doll quilt – I just start sewing and making one decision at a time when necessary. I have designed several quilts this way. I also used Hobbs Thermore batting for this project. Hobbs Thermore is an ultra-thin 100% polyester batting that can be used with machine quilting. The size of this quilt made it the perfect project to give this batting a test run. The machine quilting went smoothly, but I am unsure if I like the ultra-thin. When they say ultra-thin, they really mean thin. I may try doubling the layers next time and see if I like that better. This doll quilt is going into my Etsy store. It is such a bright cheerful doll quilt that any little girl would love.